Stockholm is built on 14 islands and only a few are natural spots offering good views over the city. 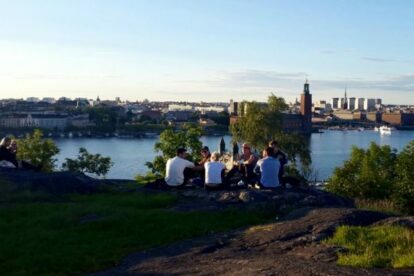 The best place for me is Skinnarviksberget (literally ‘the mountain bay of leather’ because once upon a time this was a place where leather was manufactured and tanned), the southern highest natural point: 53 meters above sea level, it has a magnificent view of Kungsholmen, Gamla Stan and Stockholm City Hall. Skinnarvitksberget is always wonderful, all-year round. It’s a quiet, peaceful place in winter and a bit more crowded in summer, when locals climb up here to enjoy the sunset over the city and a picnic or a glass of wine with friends or colleagues. The small park right below the hill is also a lovely spot, and the way up to the top (10 minutes walking from Gamla Lundagatan street) is a pleasant walk through some traditional red wooden houses (stuga or torpet in Swedish) that once belonged to fisherman or factory workers. To explain what Skinnarvitksberget is for me, I borrow the words from Nina Johansson, a Swedish painter who apparently loves Skinnarviksberget as much as I do: “It’s meditative to sit and watch things happening from above, without attending, just hearing a gentle buzz from a city in vacation mode“. As simple as that.